Brain Age: Train Your Brain in Minutes a Day!, also known as Dr. Kawashima's Brain Training: How Old Is Your Brain? in PAL regions, is an entertainment video game that employs puzzles. It was developed and published by the video gaming company Nintendo for the Nintendo DS handheld video game console. Nintendo has been careful not to claim the game has been scientifically validated, however stating that it is an 'entertainment product "inspired" by Dr. Kawashima's work' in the neurosciences. It was first released in Japan, and was later released in North America, Europe, Australia, and South Korea. It was followed by a sequel titled Brain Age 2: More Training in Minutes a Day!, and was later followed by two redesigns and Brain Age 2 for the Nintendo DSi's DSiWare service which uses popular puzzles from these titles as well as several new puzzles. Brain Age features a variety of puzzles, including stroop tests, mathematical questions, and Sudoku puzzles, all designed to help keep certain parts of the brain active. It was included in the Touch! Generations series of video games, a series which features games for a more casual gaming audience. Brain Age uses the touch screen and microphone for many puzzles. There has been controversy over the game's scientific effectiveness. Brain Age is played with the Nintendo DS held sideways. Brain Age is designed to be played a little each day, similar to the Nintendogs titles and Animal Crossing: Wild World. The Nintendo DS is held on its side, with the touch screen on the right for right-handed people and the left for left-handed people. The game is entirely touch and voice-controlled – the player either writes the answer to the puzzle on the touch screen or speaks it into the microphone. Before the player can begin a Brain Age session, he or she must input information. First, players must confirm the date and select which hand they write with. The player then inputs his or her name and date of birth. At the end of all Brain Age Check puzzles, Training puzzles, Quick Play puzzles, and Sudoku puzzles, the player is shown how quickly he or she completed it, the player's speed (according to metaphors such as "bicycle speed" and "jet speed", the highest being "rocket speed"), and a tip for either improving the player's brain or a game-related tip. If the player's time or score in Brain Age Check or Training is high enough, it will appear on one or both of the Top Three. The Top Three shown is the player's own top three attempts at a puzzle, while he or she can also compare the top three with those of other saved players. While the player is navigating the menus outside of the puzzles, Professor Kawashima is always seen on the top screen as a floating, three-dimensional head. Brain Age allows up to four players to save profiles on one DS game card, and these players can interact with each other in several different ways. There are five modes of play – Brain Age Check, Training, Quick Play, Download, and Sudoku. When starting a session, Kawashima may ask the player to participate in a Picture-Drawing Quiz, which requires the player to draw a person, place, or thing by memory using the touch screen. After the player has done all three, the game will compare his or her drawing to an example created by the game developers, along with advice of what to emphasize on below its image. If more than one player profile is saved on the game card, images for the day can be compared to those of other players. Kawashima may also ask the player to participate in a Memory Quiz, which requires the player to recall a recent event, such as what the player ate or the most interesting thing you saw on television the day before. Several days later, it will ask for the answer you provided, and will then compare the answer given several days ago and the answer given on the current day to test your recollection skills. The player is not scored on his or her ability to remember. The purpose of these tasks is to help the player improve his or her recollection. The game includes four modes: Brain Age Check, Training, Quick Play, and Sudoku. The Brain Age Check gives the player three puzzles to complete. The first is usually a Stroop test, although the player can choose to skip the Stroop test if he or she is not in a quiet environment or is otherwise unable to speak into the microphone. At the end of the Brain Age Check, the game reports on the players "brain age", a theoretical assessment of the age of the player's brain. The higher the brain age, the worse the player performed. The best possible score is 20, according with Kawashima's theory that the brain stops developing at 20. The player may replay the Brain Age Check, but it will not change the brain age for the day. Once the player confirms whether or not he or she can speak into the microphone, Professor Kawashima will describe the first puzzle. If the player answered that he can speak, the game begins with a Stroop test; if the player cannot use the microphone, the game picks a random puzzle from the following: Calculations X 20, Word Memory, Connect Maze, Number Cruncher, and Speed Counting. During the Stroop Test, the game will display one of four words: blue, black, yellow, and red. A random word will appear on screen, one after another, each appearing in a random color (which may not match the color denoted by the word). The player is instructed to say the color of the word, rather than its semantic meaning (e.g., if the word Yellow appears in blue letters, the player should say "blue" – see Stroop effect for details). In Speed Counting, which requires speaking but does not use the microphone, the player counts up from one to 120 as fast as he can without slurring the names of numbers. Word Memory gives the player a list of 30 four-letter words. The player is given two minutes to study the list and memorize as many words as possible. After this two minutes is up, the player must write down as many words as he or she can in three minutes. Another puzzle called Connect Maze gives players a randomly created group of circles, with letters and numbers in them. There is one circle for every letter in "A" through "M", as well as a circle for every number from 1 to 13. The player must then connect a line between a letter and a number, starting with "A". The player must connect the letter "A" to the number one, and then connect it to the letter "B" and then the number two, and so on until the player reaches 13. Calculations X 20 presents the player with 20 mathematical equations, including addition, subtraction, and multiplication. On the top screen are the questions, which scroll up as they are answered (whether correctly or incorrectly), while the touch screen is used to write out the answer. In Number Cruncher, the player is presented with a series of screens displaying several numbers, which vary in their appearance and on-screen behavior. For instance, a screen may display five blue numbers, three red numbers, and one moving yellow number, and above it is a question, such as "how many blue numbers are there? ", which the player must answer as quickly and accurately as possible. The Training mode allows the player to play a variety of puzzles, with all but one of the puzzles being exclusive to the Training mode. Once the player completes at least one puzzle, Kawashima awards him or her with a stamp, which he places on the current date. If the player places at least three puzzles, the stamp will expand in size. After accumulating a certain number of stamps, Kawashima will award him or her with a new puzzle, difficulty mode, or additional feature under the Options menu. Each puzzle can be played as many times as the player likes, although only the first play-through of the day will count in the graph for that puzzle. 1. Calculations X 20 which is the same as the one found in the Brain Age Check. One question will appear on the top screen, and the player must hand-write the answer on the touch screen. There are a total of 20 questions, including addition, subtraction, and multiplication. 2. Calculations X 100, which is the same as Calculations X 20, although with 100 questions instead of 20. It features a Hard mode, which has the same mechanics but adds division problems. 3, Reading Aloud, which gives the player an excerpt from a classic story such as The Legend of Sleepy Hollow or Little Women, and tasks the player with reading the story aloud to see how quickly he can do it. The player progresses through the excerpt by pushing Next, until he reaches the end of the excerpt. If the player pushes Next too quickly, the puzzle will end prematurely. 4. Low to High features several boxes on both screens, each in the same pattern as each other. The game will count down at varying speeds, and when it hits zero, numbers will appear in these boxes for a short period of time. Afterwards, the player must touch the boxes on the touch screen from lowest number to highest by memorizing the numbers on the top screen. Afterwards, the game will introduce one puzzle after the other in a similar fashion. The quantity of boxes to memorize increases after each correct answer, and decreases after each incorrect answer, with the minimum quantity of boxes being four. 5. Syllable Count, which shows several phrases one after the other on the top screen, and the player must write the number of syllables in each phrase on the touch screen. 6. Head Count features a group of people on the top screen (eg. 4). After a few seconds to allow the player to count the number of people, a house falls over them. The player must watch the screen carefully, as the people inside will leave the house and more people will enter the house. This will eventually cease, and the game asks the player to write down how many people are currently in the house. The puzzle gets more difficult as the player progresses in it. There is also a hard mode in which people also come in and out of the chimney. 7. Triangle Math has a series of mathematical equations that the player must solve. It is designed similarly to the Calculation puzzles, in that the equation appears on one screen, and the player writes the answer on the touch screen. The equations involve three numbers and two mathematical operations (e.g., 3 + 4 + 8 or 3 − 4 + 8), and are solved by performing the first operation, and then the second. This also features a hard mode where an extra tier is added to the triangle. 8. Time Lapse displays two analog clocks (eg. one at 2:45 and one at 7:30), and requires the player to calculate the difference in time between these clocks. 9. Voice Calculation, which is similar to the Calculations puzzles. However, this puzzle requires the player to speak the correct answer into the microphone instead of write it on the touch screen, similar to the Stroop Test. Quick Play can be played by anyone, whether he or she has a saved file or not. Quick Play allows the player to play three modes – Quick Brain Age Check, Quick Training, and Quick Sudoku, all only providing the player with one of the easy puzzles in each of these modes to try. Quick Brain Age Check only allows the player to play the stroop test. In Quick Training, the game only allows the player to play Calculations X 20. And in Quick Sudoku, the play may only play the easiest Sudoku puzzle available. At the end of each session, the player's brain age or time will be assessed, and Kawashima will give a preview of the full game. A player with a copy of Brain Age can send certain game data to other Nintendo DS consoles using the DS Download Play feature. He or she may either download Quick Play mode to this player's Nintendo DS, or Calculations X 30, a variation of the other Calculation puzzles which can be played by up to sixteen people. Brain Age includes 100 Sudoku puzzles. Included in the North American, European, and Australian versions of this game is a Sudoku mode, which features more than 100 puzzles across three different modes – Beginner, Intermediate, and Advanced. 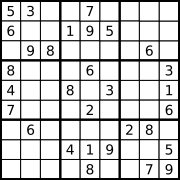 Sudoku involves a 9x9 grid with numbers in every square. Some of these numbers are visible, while others are not. The objective is to fill in the hidden numbers using the visible numbers as hints. Each row, column, and 3x3 grid has nine squares in it, and each must contain each number in the range from 1 to 9. Although the game was developed in conjunction with Professor Ryūta Kawashima, the effectiveness of the game in maintaining mental fitness amongst its users remains unclear. While studies have found a correlation between level of mental stimulation and risk of dementia/Alzheimer's, it remains unclear whether users of Brain Age games achieve any preventative benefit from use of the games. Nevertheless many neurologists recommend the game for prevention of dementia/Alzheimer's. Nintendo of America has refused to support any scientific claims to the benefits of the game, stressing that they are in the entertainment business. One study involved 600 Scottish students with one group of students who played twenty minutes of Brain Age before class daily for nine weeks and a control group that studied regularly. The students were tested at the beginning and end of the study. In the end, the group that played Brain Age improved test scores by 50%. The time to complete the tests in the Brain Age group dropped by five minutes, and this improvement doubled that of the control group. Another study involved 67 ten-year-olds and found no evidence to support claims that Brain Age improves cognitive function and may, in fact, harm it. Professor of cognitive psychology Alain Lieury at the University of Rennes, Brittany said, "The Nintendo DS is a technological jewel. As a game it's fine. But it is charlatanism to claim that it is a scientific test." Helping children with homework, reading, playing Scrabble or Su Doku, or watching documentaries matched or beat the benefits of Brain Age. The children were split into four groups. The first two completed a seven-week memory course on a Nintendo DS, the third did puzzles with pencils and paper, and the fourth went to school as normal. Researchers found that children playing Brain Age failed to show any significant improvement in memory tests. They did do 19% better in mathematics but so did the pencil-and-paper group, and the fourth group did 18% better. In memorization, the pencil-and-paper group had a 33% improvement, while the Brain Age group performed 17% worse. In logic tests, the Brain Age group had a 10% improvement as did the pencil-and-paper group. The children who had no training improved 20%. It has also been stated that the same effects of "keeping the brain sharp" can be achieved by either playing Sudoku, Tetris or talking with friends. .
Nintendo was looking for something new to develop that would appeal to both traditional and casual gamers. In one of the meetings, the Chief Financial Officer of Nintendo's Japanese division suggested reviewing a published book titled Train Your Brain: 60 Days to a Better Brain, which was enjoying a great deal of success in Japan. Satoru Iwata, the president of Nintendo, arranged for a meeting with Professor Ryuta Kawashima, the author of the book. As both Iwata and Professor Kawashima were too busy to meet under normal circumstances, they both agreed to meet for an hour during the Nintendo DS launch. The original meeting became a brainstorming session that lasted for three hours, in which Professor Kawashima explained the basics of his studies. Iwata assigned a team of nine developers to develop the game and to have it ready in 90 days for demonstration. Brain Age's sound director was Masami Yone, while the music was composed by Minako Hamano and Akito Nakatsuka, both having composed music for Nintendo games as early as 1993 and 1987 respectively. The main menu song from this game was later used in Super Smash Bros. Brawl. Initial reactions from retailers was concern about the new title's ability to sell. The most important retailers in Japan were given the game for 15 minutes to test it out. In the end, Nintendo secured nearly 70,000 orders for the first shipment, an amount above most expectations. In comparison, the sequel had over 850,000 orders placed before its launch. Brain Age met with positive sales figures. The game debuted selling around 43,000 copies in May 2005, considered a good number for an educational title. Although most titles only stay in the Japanese weekly top ten list of games for a couple of weeks, DS Training for Adults managed to stay, as of January 2006, between the most sold games for 34 weeks (except three weeks). As of June 11, 2006, Brain Training has sold 2,322,970 copies in Japan alone. It was the 94th best-selling game in Japan in 2008, selling 140,992 copies, with total lifetime sales of 3,750,890. During its first three weeks on sale in North America, Brain Age sold 120,000 copies, becoming the fifteenth title in the top U.S. video game charts during the month of May in terms of units sold. The title has stayed in the top ten of both Amazon and Best Buy list since its release. [dead link] In Europe, Brain Training received critical acclaim, becoming number 1 in the Nintendo DS sales chart, and number 4 in the all-platforms chart on debut, and selling more than 500,000 units in just over two months. As of January 22, 2007, Brain Training has sold over 2 million copies in Europe. As of October 30, 2007, Brain Training has sold over one million copies in the United Kingdom. As of September 30, 2008, Brain Age and Brain Training combined have sold 14.48 million copies worldwide, according to Nintendo. It was the 10th best-selling Nintendo DS game of December 2008 in the United States. The game was received with somewhat mixed reviews in the Western market. The reviews were generally positive. Many of them criticized the game for having poor voice and handwriting recognition at times. The game's design earned it Edge magazine's EIEF06 Edge Award for innovation. In 2007, Brain Age received the Interactive Achievement Awards for handheld game of the year. The game has also been featured in numerous media apparitions including newspapers and television in different countries, including the United States (Time magazine and Discovery Channel) and Australia (featured in Seven News). The positive sales figures and overall reception in Japan led to Brain Age being released in various countries around the world. In the North American market, the game is known as Brain Age: Train Your Brain in Minutes a Day and was released on April 17, 2006, and included 108 Sudoku puzzles of different levels of difficulty. Nintendo gave out copies of the North American version of Brain Age at the 2006 Game Developers Conference. They also shipped free retail versions to special members of the Nintendo NSider Forums. Both groups received their copies before the official release date. It has also been given away to certain retailers with the purchase of a Nintendo DS Lite. The game was released as "Dr. Kawashima's Brain Training: How Old Is Your Brain?" in the UK and Ireland. Like the American version, this version also features Sudoku. All 3 parts are saved on one cartridge. In the UK, its initial television commercials featured Chris Tarrant. Nicole Kidman, Ronan Keating, and Patrick Stewart feature in current European commercials for the Brain Training series. Nintendo Australia featured an ad campaign that coincided its Australian release. During the period of June 15, 2006 to July 17, 2006, Nintendo Australia stated that for every copy of Brain Training purchased, Nintendo would donate $1.00 to Alzheimer's Australia. The game was one of the launch titles for the DS Lite in South Korea, along with English Training: Have Fun Improving Your Skills!. It was released on January 18, 2007. ^ In Japan, the game is known as Tōhōku Daigaku Mirai Kagakugijutsu Kyōdōkenkyū Center Kawashima Ryūta Kyōju Kanshū Nō o Kitaeru Otona no DS Training (東北大学未来科学技術共同研究センター川島隆太教授監修 脳を鍛える大人のDSトレーニング; Tohoku University Future Technology Research Center: Professor Ryuta Kawashima's Train Your Brain – DS Training For Adults). ^ Simon Hayes (June 2006). "Nintendo in Alzheimer's battle". AustralianIT. http://www.australianit.news.com.au/story/0,24897,19321077-16123,00.html. Retrieved on 2009-01-03. ^ Catherine Arnst (September 2006). "Chicken Soup For The Aging Brain". Business Week. http://www.businessweek.com/magazine/content/06_39/b4002100.htm?chan=tc&campaign_id=rss_tech.rss091506a. Retrieved on 2006-10-23. ^ No author (September 2008). "Computer game boosts maths scores". BBC News. http://news.bbc.co.uk/2/hi/uk_news/scotland/7635404.stm. Retrieved on 2009-01-28. ^ Adam Sage (January 2009). "Nintendo brain-trainer 'no better than pencil and paper'". Times Online. http://technology.timesonline.co.uk/tol/news/tech_and_web/gadgets_and_gaming/article5587314.ece. Retrieved on 2009-01-28. ^ a b Simon Carless Simon. "Breaking: GDC - Detailed Nintendo Keynote Coverage". Gamasutra. http://www.gamasutra.com/php-bin/news_index.php?story=8656. Retrieved on 2006-08-23. ^ "Brain Age: Train Your Brain in Minutes a Day! for Nintendo DS - MobyGames". MobyGames. mobygames.com. http://www.mobygames.com/game/brain-age-train-your-brain-in-minutes-a-day. Retrieved on 2008-03-08. ^ "MobyGames - Minako Hamano". MobyGames. mobygames.com. http://www.mobygames.com/developer/sheet/view/developerId,56231/. Retrieved on 2008-03-08. ^ "MobyGames - Akito Nakatsuka". MobyGames. mobygames.com. http://www.mobygames.com/developer/sheet/view/developerId,59334/. Retrieved on 2008-03-08. ^ Sakurai, Masahiro (2007-10-22). "PictoChat". Smash Bros. DOJO!!. Smashbros.com. http://www.smashbros.com/en_us/stages/stage15.html. Retrieved on 2007-10-22. ^ "Brain Age: Train Your Brain in Minutes a Day!". Metacritic. http://www.metacritic.com/games/platforms/ds/brainage?q=brain%20age. Retrieved on May 9 2008. ^ "Brain Age - DS". Game Rankings. http://www.gamerankings.com/htmlpages2/931667.asp. Retrieved on June 11 2006. ^ Tsao, Jennifer. "Brain Age: Train Your Brain in Minutes a Day review". 1UP.com. http://www.1up.com/do/reviewPage?cId=3151759. Retrieved on May 9 2008. ^ "Brain Age Review". GameSpot. http://www.gamespot.com/ds/puzzle/brainagetrainyourbraininminutesaday/review.html?q=brain%20age&tag=result;full%20review;1. Retrieved on May 30 2007. ^ "BBrain Age: Train Your Brain in Minutes a Day (DS)". GameSpy. http://ds.gamespy.com/nintendo-ds/nou-o-kitaeru-otona-no-ds-training/701834p1.html. Retrieved on May 30 2007. ^ IGN Staff. "Brain Age: Train Your Brain in Minutes a Day Review". IGN. http://ds.ign.com/articles/702/702057p1.html. Retrieved on May 30 2007. ^ "Media Create Software Sales: 29 May - 4 June". Media Create, GameScience. 2006-06-06. http://game-science.com/news/001375.php. Retrieved on June 11 2006. ^ "2008 top 100". Kyoto.zaq.ne.jp. http://www.kyoto.zaq.ne.jp/dkbkq103/yso/top100/2008.htm. Retrieved on 2009-1-21. ^ Tor Thorsen. "US Console charts: May 14-20". Yahoo!. http://videogames.yahoo.com/newsarticle?eid=458782&page=0. Retrieved on June 11 2006. ^ Tim Surette (2006-07-07). "US console sales charts: June 25-July 1". GameSpot. http://www.gamespot.com/news/6153672.html?part=rss&tag=gs_news&subj=6153672. Retrieved on July 7 2006. ^ "Kawashima Is Top Doc!". Nintendo Official Magazine. http://www.officialnintendomagazine.co.uk/news_200606_charts.html. Retrieved on 2006-06-30. ^ "Europe goes Brain Training mad!". Nintendo of Europe. http://www.nintendo-europe.com/NOE/en/GB/news/article.do?elementId=JvFzofS6ffU8V0PrOkzRJXbrMdkR24AG. Retrieved on 2006-08-10. ^ "Nintendo DS breaks sales records". Nintendo Europe. 2007-01-22. http://www.nintendo-europe.com/NOE/en/GB/news/article.do?elementId=s1KSQDjJTlqOAR6k_40g9_yEHJiSwlky. Retrieved on May 30 2007. ^ "Financial Results Briefing for the Six-Month Period Ended September 2008" (PDF). Nintendo. 2008-10-31. 6. http://www.nintendo.co.jp/ir/pdf/2008/081031e.pdf#page=6. Retrieved on 2008-10-31. ^ "Top 10 Games of December 2008, By Platform". blog.Wired.com. 2009-1-18. http://blog.wired.com/games/2009/01/top-10-games-of.html. Retrieved on 2009-1-19. ^ globeandmail.com: Brain Age: Train Your Brain in Minutes a Day! ^ "Players Flex Their Mental Muscles With Brain Age For Nintendo DS". Nintendo.com. 2006-01-30. http://www.nintendo.com/newsarticle?articleid=0QIMtjJfiaXyk8_1LzZunLkbKAq86WVl&page. Retrieved on June 11 2006. ^ "Brain Age American TV Ad". Kotaku. 2006-04-21. http://www.kotaku.com/gaming/brain-age/brain-age-american-tv-ad-168736.php. Retrieved on June 11 2006. ^ "Brain Training featured on Seven News - UPDATE". Aussie-Nintendo.com. 2006-06-02. http://www.aussie-nintendo.com/?v=news&p=3418. Retrieved on June 11 2006. ^ Michael McWhertor (2006-06-11). "Free Brain Age With DS Lite Purchase". Kotaku. http://www.kotaku.com/gaming/brain-age/. Retrieved on June 11 2006. ^ "Dr. Kawashima’s Brain Training". Revolution Europe. http://www.revo-europe.com/game.php?gid=dsbrain. Retrieved on 2006-06-11. ^ Nick Clayton (July 15, 2006). "Nintendo start to think outside the box". Living - Digital Culture (Scotsman.com). http://living.scotsman.com/digital.cfm?id=1019962006. Retrieved on 2006-08-18. ^ "Keep Your Brain Stimulated: Dr. Elizabeth Zelinski speaks". Nintendo of Australia. http://www.braintraining.com.au/stimulated.html. Retrieved on 2006-08-10. ^ "매일매일 DS 두뇌 트레이닝". Nintendo of Korea. http://www.nintendo.co.kr/www/soft/brain_main.php. Retrieved on May 30 2007. This page was last modified on 19 March 2009, at 17:46.